When you cross a road towards TNM, you’ll find Main Gate. You can purchase tickets at Main Gate Plaza. Please show your tickets to TNM staff at the entrance. Wheelchairs and walking sticks are available at Main Gate Plaza. When you show your disabled ID, you and another individual’s visit to regular exhibition will be free of charge. 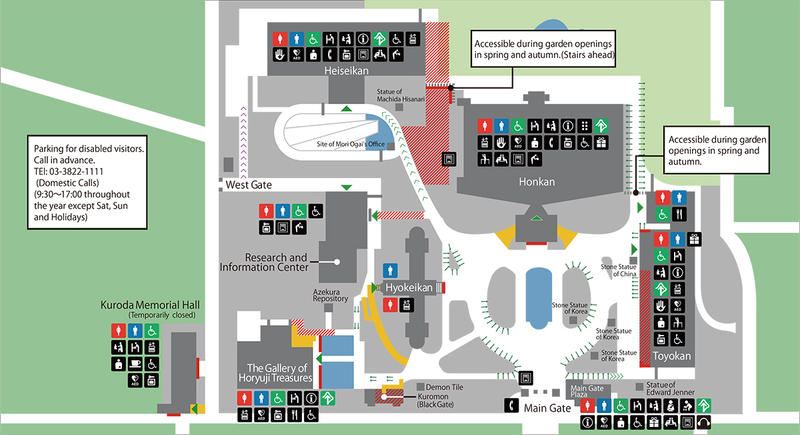 Visitors with wheelchairs may ask TNM staff to use disabled parking. This parking is not available for general visitors. At your entrance from Main Gate, you’ll find Honkan in front, Heiseikan at your 11 o’clock, Hyokeikan and Research and Information Center at your 10 o’clock, Kuromon black gate and Gallery of Horyuji Treasures are located at your further left. Toyokan is on your right hand side. There are diverse kinds of plants in TNM. Please enjoy seasonable flowers and various landscapes. There is a Japanese garden behind Honkan. The garden is opened twice a year in spring and fall, and visitors can enter for a walk. After your entrance from Main Gate, you may go into the garden from a side way at Toyokan Hotel Okura Yurinoki. Five tea houses are available for occasions like tea ceremonies or haiku poetry gatherings when garden is opened or closed. Tea house tours and Okyokan tea ceremonies are organized monthly by TNM volunteers. There is an Important Cultural Property, Kuromon black gate, on your left from Main Gate. Kuromon was removed from a previous daimyo residence of Ikeda family. Kuromon opens between 10am and 4pm on Saturdays, Sundays and holidays. There is a slope for wheelchairs in front of Kuromon. Behind Research and Information Center, there is an Important Cultural Property, Azekura repository. There are outdoor toilets located in Main Gate Plaza.